The city of St. Paul will continue to do water line replacements along Smith Avenue in the coming weeks. Once again this is not the impending High Bridge closure, which isn’t happening until fall. The work is expected to last five days. Crews will continue working their way up Smith with detours to side streets as appropriate (exact detour routes haven’t been worked out yet). By now you’ve probably noticed the road closure signs on the High Bridge. Fear not! The bridge is not closing early. Here is a statement from the city of St. Paul. The city is closing a short section of Smith Avenue on the north end of the High Bridge as part of a lead replacement project. The bridge itself will not be closed. Smith Avenue will be closed from McBoal Street to Cliff Street (two blocks) starting Monday, April 10 through April 17. Restoration will follow and the work should be finished by Wednesday, April 19. There will be a short traffic detour from Smith Avenue using Cliff Street, St. Clair Avenue and West 7th Street. 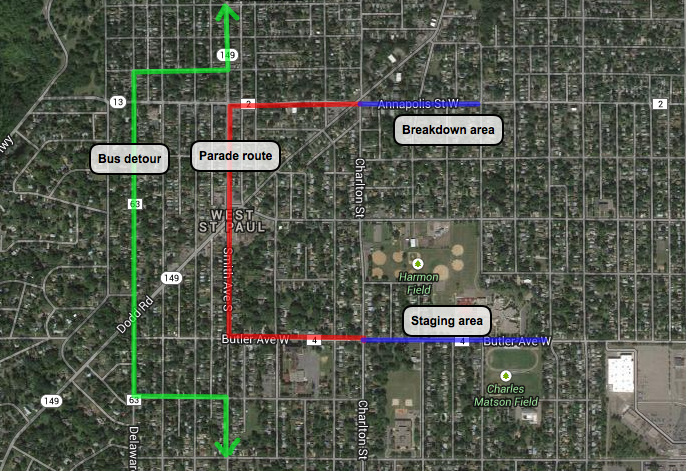 Here is a link to the city’s road closures map and list: https://www.stpaul.gov/residents/road-closures. Once work is complete on the north end of the bridge, the city will move to the south side. They will be working in the area for a couple of months, most likely. If you need further details, please contact Jodi Wallin with the city of St. Paul: jodi.wallin@ci.stpaul.mn.us. Note that this is a city project, not MnDOT. Not clear yet if the work on the south side of the bridge will involve street closure but hope to have an update soon. The closure of the High Bridge is still scheduled for later this fall. As entertaining (?) as the presidential campaign can be, let’s not forget that local elections are important too. Here is a link to last night’s candidate forum for West St. Paul. Remember that Smith Avenue and Dodd Road are scheduled for reconstruction by MnDOT in 2018, but any improvements/upgrades not directly related to the roadway or bringing sidewalks to basic ADA compliance will be up to the city. The Smith/Dodd corridor is in Ward 3, John Ramsay and Dave Napier are the candidates for that seat. Jenny Halverson is challenging David Meisinger for mayor. To briefly recap the responses, Napier supports implementation of the city’s bike/pedestrian plan, Ramsay says because he and his immediate family seem to have no trouble getting around, he sees no reason to change the status quo. Because of the timeframe for this project, this election could have implications for our neighborhood for decades to come. The choice is pretty clear, depending on whether you want to see changes or if you like things the way they are. Please research the candidates carefully and choose wisely.